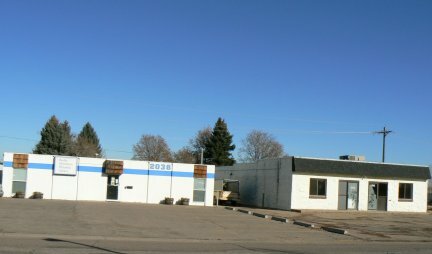 The Rocky Mountain Philatelic Library (RMPL) celebrated the one year anniversary of its purchase of an adjacent building for expansion on December 4. A press release issued by RMPL looks back over this past year and chronicles many of the library’s accomplishments. Significant strides were made in the renovation of the newly acquired building almost all of which was accomplished by volunteers. Immediately after purchase the additional space was being utilized for a wide variety of philatelic meetings and events. The new space has enabled the library to make its collection of around 10,000 books and 1,100 periodical titles much more accessible. The acquisition of the new building included outside space which has been transformed into an attractive garden area by volunteer help. Besides the many hours worked by volunteers to remodel and update the new building, the RMPL also has initiated an adult education program in affiliation with Denver University titled World History Through Stamps. This is an 8-week program presented by RMPL members, that began in September 2010, and is being repeated for the 2011 Winter and Spring semesters. I reported earlier on the library’s publication of Mexico’s Denver Printing of 1914 by Ron Mitchell. The membership of the library has grown to over 500. The RMPL’s newly revamped website includes more information and photos about the library and its expansion. In 2006, the APRL received a large donation from Apfelbaum. Yesterday I talked to a group of Girl Scouts about library collections. One of the things they wanted to know was how libraries get their books and how librarians decide which books to add to the collection. Some libraries buy books, I told them, but here at the APRL we rely primarily on donations to grow our collection. Almost every day, boxes of books, journals, manuscripts, and research files arrive at the APRL. Library staff open these gifts, and add those that are appropriate for our collection to the catalog so that members can use them. 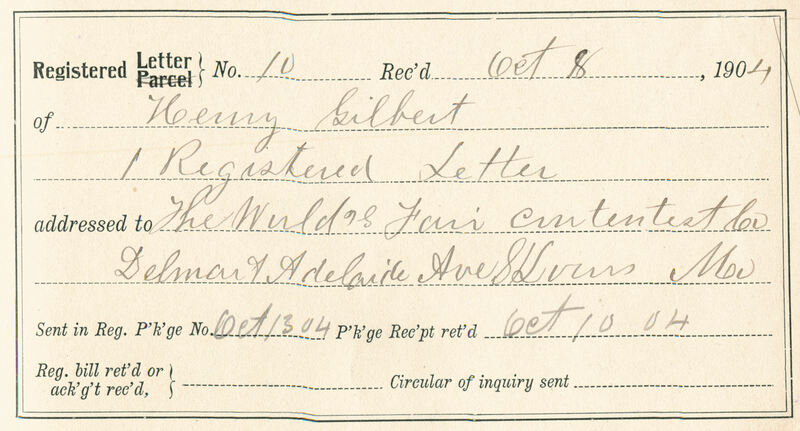 Each issue of the Philatelic Literature Review includes a list of new arrivals, as well as a list of the generous individuals and companies who donated material to the Library. We also receive monetary donations to purchase books, microfilm, equipment, and furniture. So, on the day before Thanksgiving here in the U.S., the APRL says “Thank you” to all of our generous benefactors. If you are interested in donating materials or money to the APRL, please contact us to discuss your donation. The American Philatelic Research Library is a public library under Pennsylvania law and an authorized tax-exempt, nonprofit institution under Section 501(c)3 of the Internal Revenue Code. Any donations may be tax deductible under prevailing IRS code specifications. 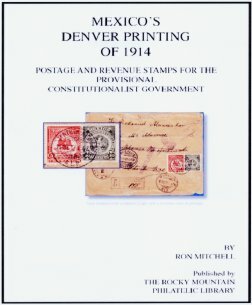 The Rocky Mountain Philatelic Library in Denver, Colorado has announced the publication of Mexico’s Denver Printing of 1914 by Ron Mitchell. The book is about the postage and revenue stamps for Mexico’s Provisional Constitutionalist Government which were printed in Denver. The November-December issue of Scribblings, RMPL’s newsletter, indicates that the book is the result of a specialized study by Mitchell which started in 1974. According to the announcement, “The book is an excellent resource, not only for the Denver Eagles, but for the philately of the 1914-1916 Mexican Revolution.” It includes censuses for both the revenues used as postage and the Denver Eagles postage stamps. The book is in full color and includes more than 400 illustrations. Included with the book is a DVD which includes digital images of all the illustrations. The price for the book is $50 postpaid to addresses in the United States. To obtain a copy send a check made out to “RMPL” to RMPL Mexico Book, 2038 Pontiac Way, Denver, CO 80224. This is the second book published by the RMPL. In 2008 it published Camp Genter, and it has plans for other publications in the future. The Slusser Memorial Philatelic Library of the Postal History Foundation in Tucson, Arizona is setting an excellent example for how postal history can be effectively incorporated into the broader history of our communities and our states. The Library is a partner with the Vail Preservation Society in a new online exhibit/collection entitled “Between the Tracks: The Story of the Old Vail Post Office”. This collaborative effort involved merging photographic items in the Vail Preservation Society with postal history items in the collection of the Slusser Library. The exhibit is part of the Arizona Memory Project which already includes three other collections from the Slusser Library. The Slusser Library is also working on collaborative exhibits about the Arizona post offices in Oracle and Jerome. 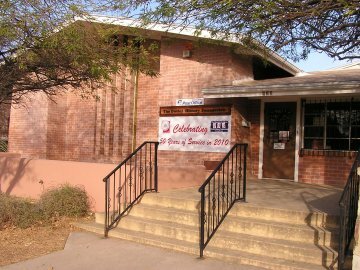 The Vail, Oracle, and Jerome post office exhibits are being funded with a federal Library Services and Technology Act grant through the Arizona State Library, Archives, and Public Records. The grant is called “Centennial Celebration of Arizona Post Offices” and the goal of this project is to preserve the history of the three post offices in preparation for the state’s Centennial. The postal history artifacts from the Slusser Library which are included in the project are from Slusser’s Arizona Postal Document Collection 1884-1949 which is part of Arizona Archives Online. The efforts of Charlotte Cushman, Slusser Library Librarian/Archivist, and the other folks at the Postal History Foundation to reach out to other cultural institutions to cooperate in promoting local and state history is noteworthy. In a recent post, he highlights one of our fellow philatelic libraries, the Rocky Mountain Philatelic Library. 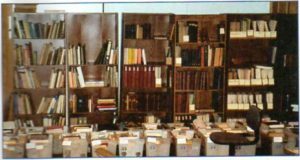 Like the Postal History Foundation’s library, described in Larry’s post on this blog, the RMPL’s holdings are included in the Philatelic Union Catalog hosted by the APRL. At the bottom of the search screen, a drop-down box allows you to search each collection individually, or all collections simultaneously. Coincidently with Larry’s posting about October being Archives month I stopped in Bellefonte, on my way home from attending the Postal History Symposium, to examine an archival collection at the American Philatelic Research Library. It consists of ledgers and official papers from the Aaronsburg, Pennsylvania Post Office spanning the 1890s until the early 1940s. As this gift had not yet been fully processed, I offered to inventory the materials and help prepare a finding aid in exchange for being able to peruse the two boxes. Not only do I expect to use some of these materials with a Summer Seminar class that I will be offering on U.S. Post Office forms. But, I also found an opportunity for more research on the role of Registered Mail in rural America. 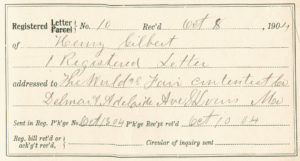 While a single form may shed light on the handling of a particular piece of mail, a Post Office ledger or collection of forms can reveal much about the operation of an individual post office and perhaps provide a window into postal operations more generally. Several years ago, I made an in-depth examination of a Registry Book from the Post Office in Stony Hill, Missouri that allowed me to draw conclusions about commerce in rural American two decades before RFD and three before Parcel Post. Since publishing that article, I have sought other Registry Books to test whether my conclusions are valid for other locations, economic conditions, and time periods. My cursory examination of the single Registry Book in this collection suggests that Registered Mail served a different function in Aaronsburg in the first decade of the 20th century than it did in Stony Hill in the 1880s. There are no doubt other undiscovered archival gems at the APRL. We expect to begin posting finding aids online next year; volunteers interested in helping should contact Tara. In the mean time, you are welcome to discuss your research projects with the library staff to learn what resources might available to support your projects. 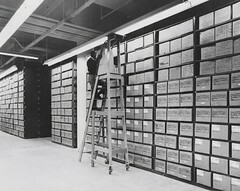 As Larry mentioned in an earlier post, October is American Archives Month. If you’re not familiar with archives, you might wonder what they are, exactly. 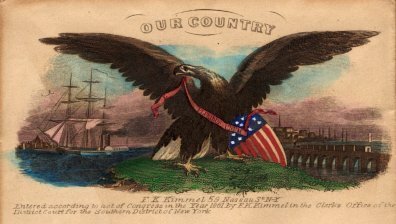 The Smithsonian Institution Archives is celebrating American Archives Month with a series of blog posts on archives, and one from the Visual Archives blog, The Bigger Picture, offers an explanation of archives. Read the explanation and find out why my post title is not as grammatically incorrect as it might seem! I’m envious of those of you who are located at a reasonable distance from a dedicated philatelic library. Although the services of the American Philatelic Research Library (APRL) are available remotely to both members of the American Philatelic Society and non-members, there’s no substitute for using a library collection in person. One of my sons and his family are located in Longmont, Colorado and as a result I’ve become a member of the Rocky Mountain Philatelic Library (RMPL) in Denver. I try to visit the library whenever I’m in the area, and I have been extremely impressed with their operation. Although the RMPL is an all volunteer operation, they have benefited greatly from the services of retired librarian Ellengail Beuthel. The library’s catalog is accessible online through their website which has been recently revamped. The RMPL is also one of the libraries that is participating in the APRL’s online union catalog. Regular membership in the RMPL is $15 but the $25 contributing membership allows you to borrow books from the library including through the mail. One of the great features of their website is access to the current issue and back issues of their outstanding newsletter Scribblings. Recently the library has greatly expanded its space by purchasing and remodeling an adjacent building. If you’re in the Denver area pay a visit to this very welcoming library, and if not, visit them online.